RIT will celebrate 50 years at the transforming Henrietta campus throughout the 2018-2019 academic year. 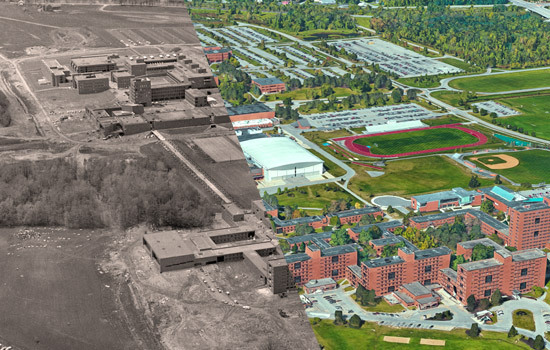 In 1968, the university moved from downtown Rochester – where it had been since 1885 – to farmland in the town of Henrietta. Explore the history at rit.edu/henrietta50: Share your memories of RIT, view historical yearbooks, read stories, watch videos and stay-up-to-date on the latest anniversary events. NTID 50th Anniversary Reunion: The anniversary marks 50 years since the first cohort of students matriculated at the National Technical Institute for the Deaf, one of the nine colleges of RIT, in 1968. A reunion will be hosted on campus June 28 through July 1. Learn more at ntid.rit.edu/50reunion. Brick City Homecoming & Family Weekend, Oct. 19–21: The annual bash includes a special Henrietta campus rededication ceremony and downtown campus rededication ceremony. 50 Acts of Kindness: This series of programs and events will demonstrate how RIT Tigers give back to the Rochester and Henrietta community. Futurists Symposium: Held at the Imagine RIT: Innovation and Creativity Festival, April 27, 2019, the event will showcase the future of technology and innovation, including what’s next at RIT. For more information on the 50th anniversary celebration of RIT’s Henrietta campus, go to rit.edu/henrietta50.